← Happy Birthday H.P.L.! The 1978 H.P.L. Panel Files Are Here! Fungi from Yuggoth Complete – Happy 120th Birthday H. P. Lovecraft! Well it appears I got it done just in time for H. P. Lovecraft’s 120th. Birthday; which is also my 20th Anniversary since sitting on his grave for his 100th. Birthday. See: http://www.flickr.com/photos/cthulhuwho1/3810075190/in/set-72157624114618268/ for that occasion! What I’ve upload here, is truly my most personal birthday gift for H.P.L.. This complete reading of his “Fungi from Yuggoth” is something I’ve wanted to do for several years, as a tribute to the Master; and as a chance to put my voice, and my spin, on one of his most memorable works. I’ve tried recording his prose, but that didn’t quite work for me; and then I started re-reading “Fungi from Yuggoth” again, now that I’m older, and my Indiana farm-boy voice has been tempered by many years in California; and the poetry seemed to be a fairly good fit, for my voice and temperment. For the die-hard individuals who believe they can take 40 non-stop minutes of my voice, I’ve included a complete version in a single file; but I’ve also included separate files for every sonnet for those who want direct access to their favorite parts. I was tempted to add background music; but I decided to let everyone have the raw reading to add their own music to it if they choose to. And I would also like to hear any copies that do get music added to them if anyone puts this files up on their sites. And please recommend any music you think I should try with my copies too. Please share these files, and ask listeners to give any positive or negative feedback here or at willhart-at-roadrunner-com. I’ve included a pdf copy of “Fungi from Yuggoth” in case my reading isn’t clear enough. And I have added (23-Aug-2010) everything you need to make a paper CD case for Fungi from Yuggoth in case you burn your files to a disc. Scroll down to the bottom of this post for those files. 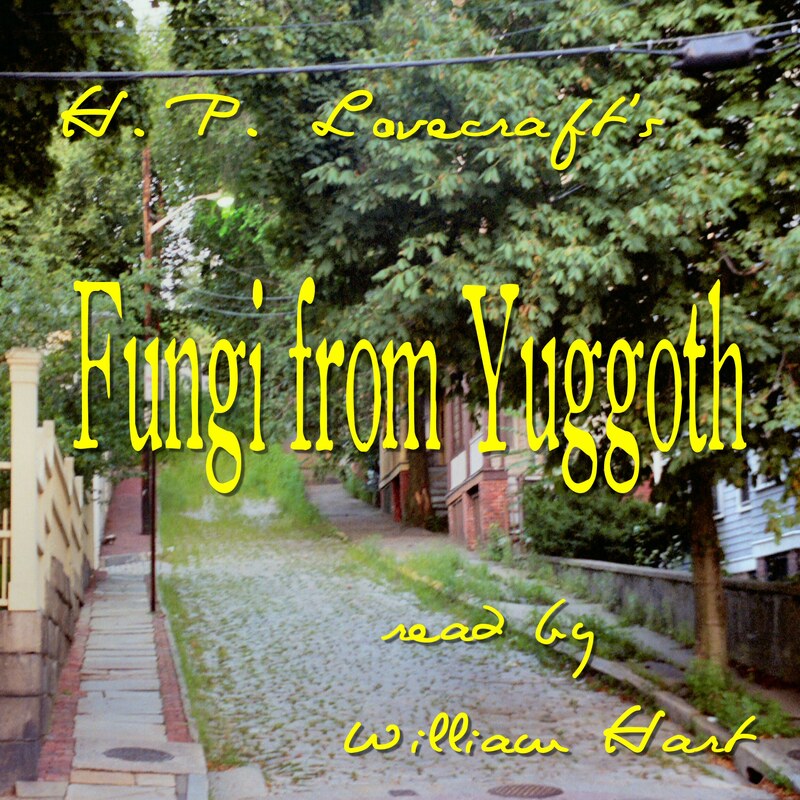 This entry was posted in Audio, Audio Book, Audiobook, Book, Books, DOC Files, Documents, Free, Fungi from Yuggoth, GIF Files, H. P. Lovecraft, MP3 Files, PDF Files, Poetry, Readings, William (Will) Hart and tagged Audio, Audio Book, Audiobook, Book, Books, CthulhuWho1, DOC, Documents, Free, Fungi from Yuggoth, GIF, Lovecraft, MP3, PDF, Poetry, Reading, Will Hart, William Hart. Bookmark the permalink. 14 Responses to Fungi from Yuggoth Complete – Happy 120th Birthday H. P. Lovecraft! Cthulhu (kə-THOO-loo) is a fictional cosmic entity created by horror author H. P. Lovecraft in 1926, first appearing in the short story “The Call of Cthulhu” when it was published in Weird Tales in 1928. This is so wonderful, Will! I am so obsess’d with these sonnets, & you read them superbly. Thank you for posting these. Poetry is always so much better when heard rather than read and these readings are very expressive. And I hope you’ll enjoy the “video” version of this with Lovecraft’s words on screen on YouTube too! Great stuff, very well done. thak ou for doing this and sharing it. And I hope you’ll also enjoy the complete twelve chapters of “At the Mountains of Madness” that I’m currently posting as soon as I get each chapter cleaned up. Thank you, Mr Hart. To my mind, Mr H.P. Lovecraft would read his sonets in a somewhat similar way – with moderate expression: not too emotionally. It’s a pleasure to hear ‘Fungi from Yuggoth’ in its original language (though our version is also very fine). You are very welcome! And Thank You for compliment and taking time to write your comment! If you truly enjoyed my reading of “Fungi from Yuggoth,” keep watching here for news of a very special musically scored production of “Fungi from Yuggoth and Other Poems;” which will be released in early 2016 by Fedogan & Bremer. After having listened to your reading of Fungi from Yuggoth I’ll be surely waiting for the other poems.